View of a purported "fossil" in the famous Mars meteorite known as Allan Hills 84001. Doubters argue that the feature is too small to be a sign of Mars life. Twenty years ago, NASA scientists and their colleagues announced they had spotted possible signs of Mars life in a meteorite. The claim ignited a scientific controversy that lingers to this day. Such magnetite particles are not known or expected to be produced by nonbiological (abiotic) processes. As such, the study team members said these crystals might constitute evidence of the oldest life-forms known, with profound implications for the presence of life in the universe. "I think the approach the group took of combining several lines of evidence was innovative and made the argument more compelling at the time," said Andrew Steele, an astrobiologist at the Carnegie Institution for Science in Washington, D.C. Soon after the 1996 announcement was made, Timothy Swindle, a planetary scientist at the University of Arizona, conducted an informal poll of more than 100 scientists to see how the scientific community felt about the claims. "On average, scientists thought that it was a completely open question whether or not there's been life on Mars, and were skeptical ... but didn't think it was ridiculous," Swindle said. Still, these claims drew major questions. Decades later, scientists are still dueling over these and similar finds. Skeptics picked apart each of the four lines of evidence presented in 1996. For instance, doubters noted that carbonate globules and organic molecules seen in ALH 84001 might have formed without the need for Martian microbes, while wormlike features that resemble fossils could actually have been uneven patches in the coating used to prepare the samples for electron microscopy. "The questions posed by the team were very difficult to refute at first, and only by a global scientific effort involving many research groups around the world [have] other interpretations become more likely," Steele told Space.com. Still, one line of evidence stubbornly resisted doubters. The Allan Hills 84001 meteorite, which researchers claimed in a 1996 Science publication, may hold evidence of ancient Mars life. This interpretation is still under dispute today. "When the ALH 84001 announcement first came out, I was intensely skeptical of all the lines of evidence for life on Mars except one — the magnetite," said Chris McKay, a planetary scientist at NASA Ames Research Center in Moffett Field, California, and no relation to David McKay (who died in 2013 at age 76). "At the time of the ALH 84001 announcement, there was no known abiotic process that could produce such magnetite crystals," Chris McKay told Space.com. "So this line of evidence was quite interesting." However, he noted that subsequent research has shown that shockwaves can generate such magnetite crystals. This weakened the case that ALH 84001's crystals were created by life, he said. 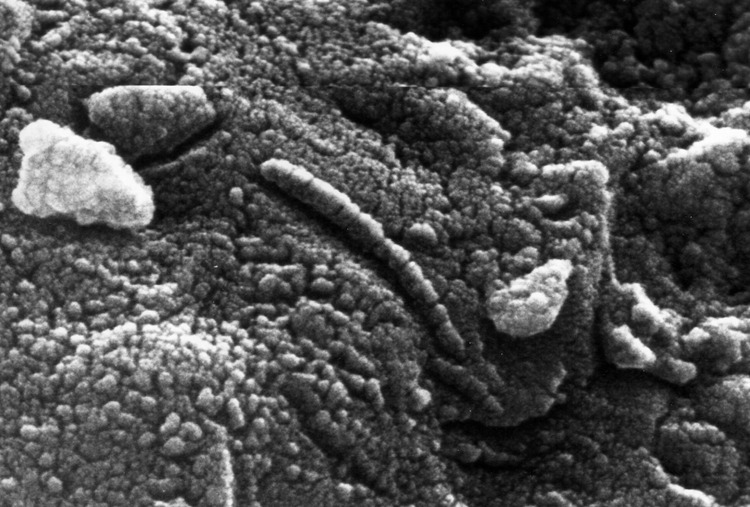 Magnetite crystals from Mars might more persuasively indicate life if they're found in string-of-pearl formations, as they are when created by bacteria on Earth, Chris McKay said. "If we find these chains on Mars, it would be compelling evidence of past magnetotatic bacteria," he said. However, so far researchers have not detected such strings, he added. Perhaps the biggest issue raised by the 1996 study "is that we really do not have a good working definition of what constitutes life," Thomas-Keprta told Space.com. "At the most fundamental level, we still do not know whether the difference between animate and inanimate is simply a difference in kind or degree. In absence of such a definition, the search for evidence of life of Mars is plagued by ambiguities." NASA's next step could be to send an upgraded rover to take soil samples and test them for ancient life. Even if ALH 84001 did not conclusively prove the existence of life on Mars, the research did benefit science, researchers said. "The interest resulted in the Mars Exploration Program being reinstated," Gibson told Space.com. "The Mars Exploration Rovers, Mars Reconnaissance Orbiter, Phoenix lander, Curiosity rover, Mars Express mission with its Beagle 2 Mars lander — all can be traced to the ALH 84001 research. The excitement of the possibility of potential past or present life on Mars is too important for humans to ignore." In addition, "the ALH 84001 announcement, despite whether you are a believer of the hypothesis or not, has clearly been the guiding idea for the development of the new interdisciplinary field of astrobiology," Gibson added. "This must be viewed as positive for the field of scientific discoveries." Steele agreed with Gibson. "Without this paper, the field of astrobiology may never have come to exist," Steele said. The scientists behind the 1996 study "continue to support our original hypothesis," Thomas-Keprta said. Gibson concurred, adding that "no scientific data has been presented to date that disproves any of the four original lines of evidence presented in 1996. Interpretation of the data is where the disagreement arises." "I think the way the story evolved was the way science is supposed to work," Swindle said. "I am skeptical that they found evidence of life, but their paper generated a huge amount of very good science in testing it, so I think it was a great paper." "The features seen in ALH 84001 probably don't come from life, but the possibility of life on Mars is still there," Swindle said.